The libertarian approach to crime is both simple and sensible. First, only activities that harm other people should be against the law. So get rid of laws against drugs, gambling, cash deposits, and other victimless crimes. Second, make sure that government behaves properly and respects constitutional rights while investigating and prosecuting criminality. Third, impose appropriate punishment on those properly convicted of harming other people. In other words, be “tough on crime,” but make sure there’s a morally just system. And I should consider adding a fourth principle, which is that laws shouldn’t be a way for governments to pad their budgets with unfair fines and other cash penalties. With this in mind, let’s explore a practical example of why it’s a good idea to make sure governments respect due process and civil liberties. I wrote last year about how the Justice Department wrongly asserted that it has the right, without following due process, to reach outside America’s borders to obtain personal information. In part, the bureaucrats at DOJ are exploiting old law that doesn’t provide clear guidance on how to deal with modern electronic communication and data storage. Fortunately, that’s something that should be easy to fix. Veronique de Rugy of the Mercatus Center correctly identifies the key issue in a column for Reason., starting with the fact that courts fortunately are not giving the feds a blank check. …the Justice Department…asserted that a U.S. search warrant should carry jurisdiction over the data of an Irish citizen being stored on a server in Ireland simply because it is owned by Microsoft, an American corporation. 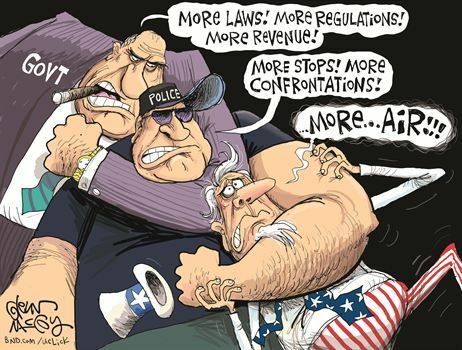 Thank goodness the federal appeals court has now rejected the government’s attempt… The outcome affirms a landmark defense of privacy rights against law enforcement overreach and clearly establishes that the U.S. government does not have jurisdiction over the entire world. It also removes a major threat to the competitiveness of U.S.-based multinational companies, which must operate under the privacy rules of the countries in which they operate. Many of those countries unsurprisingly take a dim view of U.S. government efforts to pry into the lives of their citizens. But it would be good if lawmakers modified the law so that it reflects today’s world. Members of Congress, however, shouldn’t count on either the courts or the Trump administration. Instead, they could address the fundamental issue. The root of the problem is a common one. A law—the Electronic Communications Privacy Act—was enacted in 1986 to address issues raised by the technology at the time, and Congress never bothered to update it despite significant advancements in the decades since. …This has also resulted in massive privacy blind spots—such as the ECPA’s considering emails held by a third party for over 180 days to be abandoned, allowing them to be accessed with a simple subpoena instead of a judge-issued warrant. Also of concern is that the process for working with foreign governments when investigations cross jurisdictions—through mutual legal assistance treaties, or MLATs—has been seen by officials as too cumbersome to pursue. Excessive bureaucratic red tape, in other words, has encouraged investigators to engage in a troubling power grab. And there was legislation last Congress to address these problems, with a new version already introduced in the new Congress. …a bill, the International Communications Privacy Act, that sought to resolve both of these issues. It would have updated privacy rules to acknowledge modern technological reality by doing away with such silly provisions as the 180-day rule. It also would have streamlined MLAT procedures to make international cooperation more practical. Another bill, the Email Privacy Act, was just reintroduced in the current Congress and would also update the ECPA. Amazing the House already has approved the legislation. The tech community is happy about this progress, though it’s also concerned the Senate once again will be the stumbling block. …the reintroduced Email Privacy Act easily passed the House via a voice vote, showing that our Congressional Members still recognize how important this is. Of course, now it gets to go back to the Senate, and we saw how well that worked last year. And then we have to believe that President Trump will sign the bill. …It’s great that Rep. Kevin Yoder, along with Reps. Jared Polis, Bob Goodlatte, John Conyers, Ted Poe, Suzan DelBene, Will Hurd, Jerry Nadler, Doug Collins and Judy Chu keep pushing this bill. …the fact that they’re willing to support basic 4th Amendment concepts for email is worthy of recognition. Now, hopefully, the Senate won’t try to muck it up again. I guess we’ll see whether there’s progress this year or next year. In the meantime, let’s hope that lawmakers are guided by the three principles of good criminal justice policy. P.S. And if politicians fail to follow those principles, then citizens should not feel obliged to follow unjust laws, (and hopefully their peers will back them up by practicing jury nullification). P.P.S. Since courts almost always grant search warrants, I’ve never understood why law enforcement officials want to get around this constitutional principle. Moreover, I’ve never seen any evidence that the fight against real crime somehow is compromised by having to comply with the 4th Amendment. So now, perhaps, you’ll understand why I’m willing (albeit only on one occasion) to side with Ruth Bader Ginsburg over Clarence Thomas. P.P.P.S. 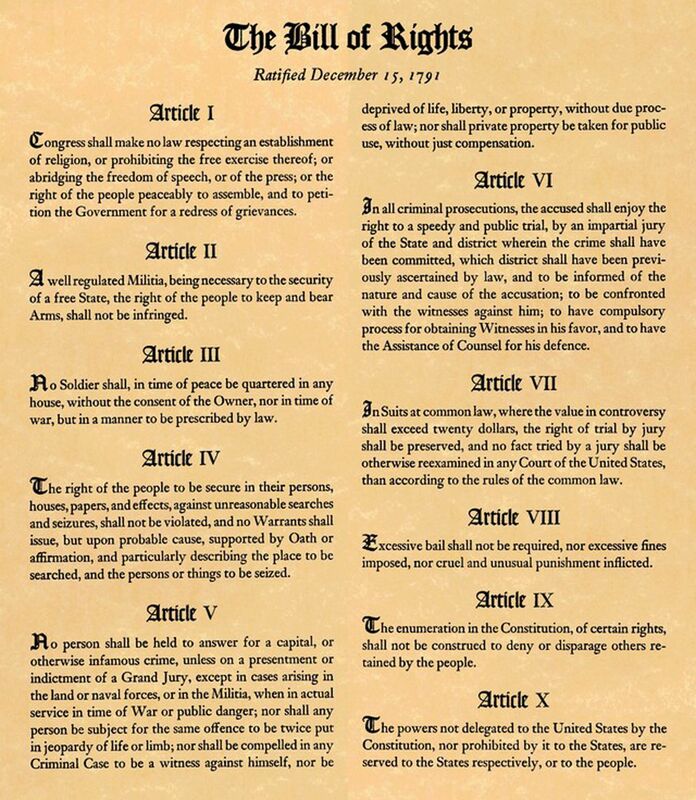 If there was a prize for undermining the Bill of Rights, Obama probably would have it on his mantelpiece.